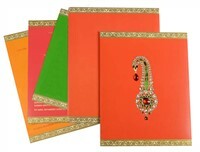 D-5633, Red Color, Shimmery Finish Paper, Designer Multifaith Invitations. Central theme is the crystal studded Kalangi (Men's Headgear). A rich gold border adorns the card.